A bus tour stops on the road as a Polar Bear appears from across the tundra to cross the road in the Churchill Wildlife Management Area in Manitoba. For the bus tours that journey through the Churchill Wildlife Management Area in Churchill, Manitoba, there is a main road that they use in search of the polar bear. Luck was on their side today as a Polar Bear decided to cross in front of the bus giving tourists a good look at a Polar Bear in his natural environment. 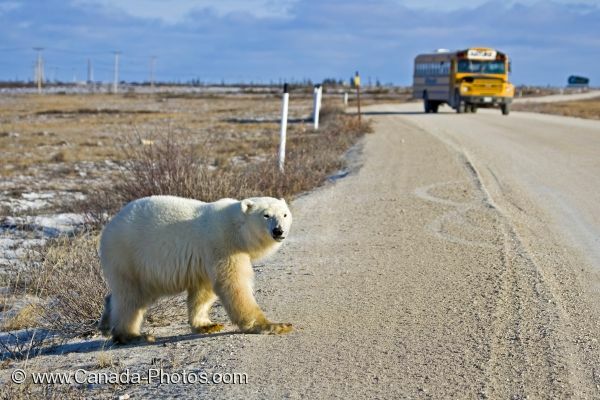 Polar Bear, Ursus maritimus, crossing the main road in front of a tourist bus, Hudson Bay, Churchill, Manitoba, Canada. Picture of a Polar Bear crossing in front of a bus tour in the Churchill Wildlife Management Area in Manitoba, Canada.